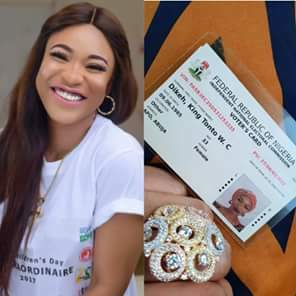 Tonto Dikeh Popular Nollywood actress, Tonto Dike has officially changed her name to ‘King Tonto'. The actress has been bearing the name on her Instagram page for some time after she got separated from her estranged husband, Olakunle Churchhill. She disclosed this on her Instagram page alongside a picture of her voter’s card as proof. “Officially changed my name to King Tonto, that feels good. “Bear with me while I opt for greatness, King Tonto,” she wrote.